All bar vests look similar on the internet, but don't be fooled. This vest is made of rich, full grain leather. Made to order for a perfect fit, this vest is a quality piece for the discerning leather enthusiast. A black leather vest is something every masculine man (gay or straight) should own. If you are looking for something distinctive and durable, this is a piece that will give you years of service. There are many inexpensive vests that look ok online, but seen in person the poor quality shows. Don't waste your time on cheap vests. A vest is something where materials and craftsmanship matter, so the old adage "you get what you pay for" holds true. We use rich, full grain leather for our vests. The first thing you notice when you put it on is that this vest is more weighty than vest made from lighter leathers. Not heavy to wear, but noticeably more substantial. It makes you want to square your shoulders and hold your head up high. People will see the difference. We are very proud of our laces because we make them ourselves. Many laces we have seen are merely leather cut in strips. Amici laces are crafted. Pure leather is folded and stitched with nylon thread, resulting in laces that are very strong in use, but also nice to the touch. We provide our laces in a range of colors at no extra cost. We have one additional charge for chest sizes greater than 44" (XXL, XXXL). Group discounts available for clubs (15% on orders of 4 or more matching vests). We ship this vest to the continental 48 United States for free. International shipping is available, contact us for details. 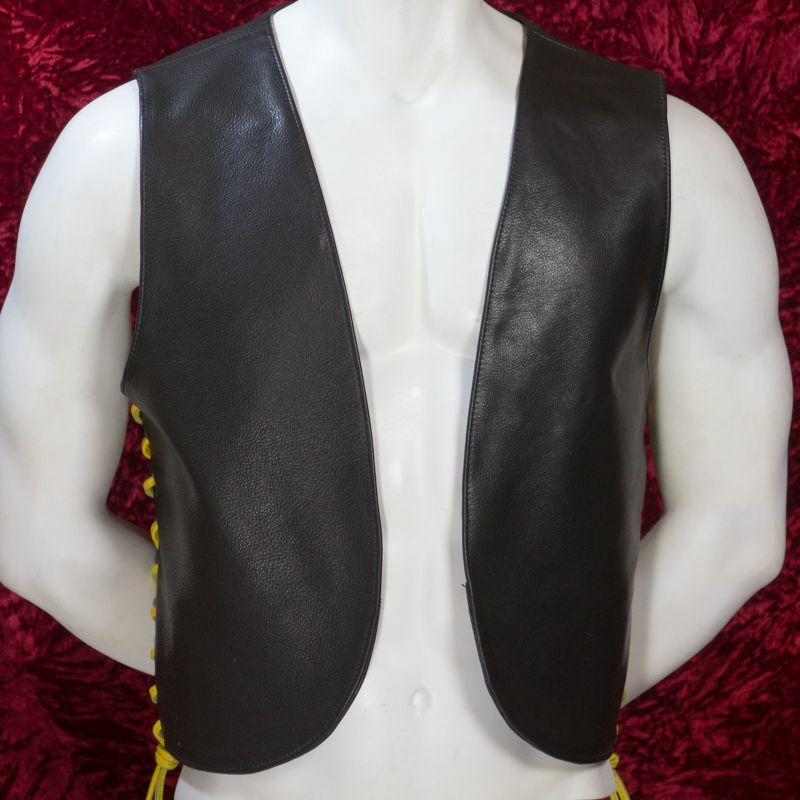 We offer this vest in 8 different colors of leather. You can change the leather color, laces color, or hardware color. Since this is made to order, there is no additional charge. For example, this vest takes on a whole new character when done in our striking bomber brown leather. We can also make your vest a dominant like pink, red, blue, or yellow. Our colored leather, like our black leather, is full grain and wonderful to the touch. This is a made to order product, fit to make you look your best. The laces down the side allow you to make adjustments over time, as your body changes. Generous room for patches and pins, front and back. Present your organizations cleanly with less crowding. Two interior pockets, for holding lightweight items.